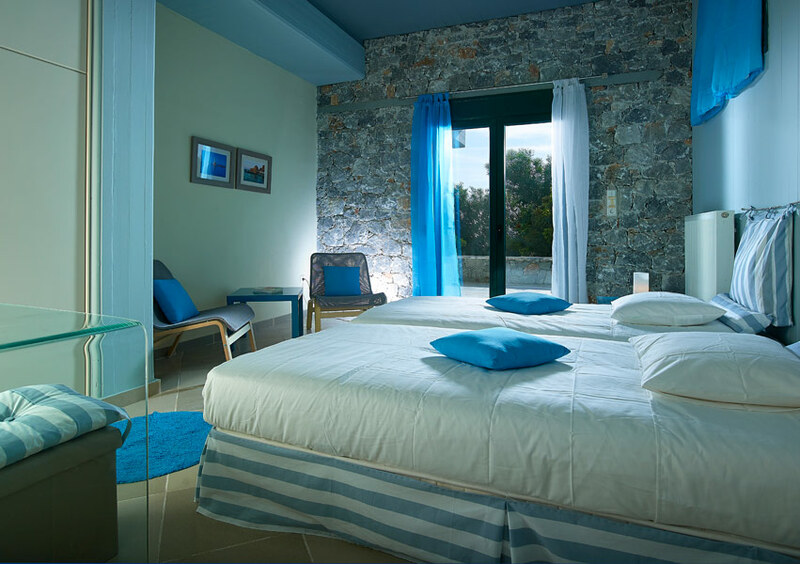 In the old Port of Chania, in the center of the Old city of Chania, on the historical island of Crete, you will find the Boutique Hotel Fortino. A beautiful old mansion recently renovated, with respect to its character and architecture, and ready to continue its 450 years history. With a stylish and suave design, elegant and warm decor, Venetian arches, works of art, the Boutique Hotel Fortino is the perfect setting for an unforgettable stay in Chania. 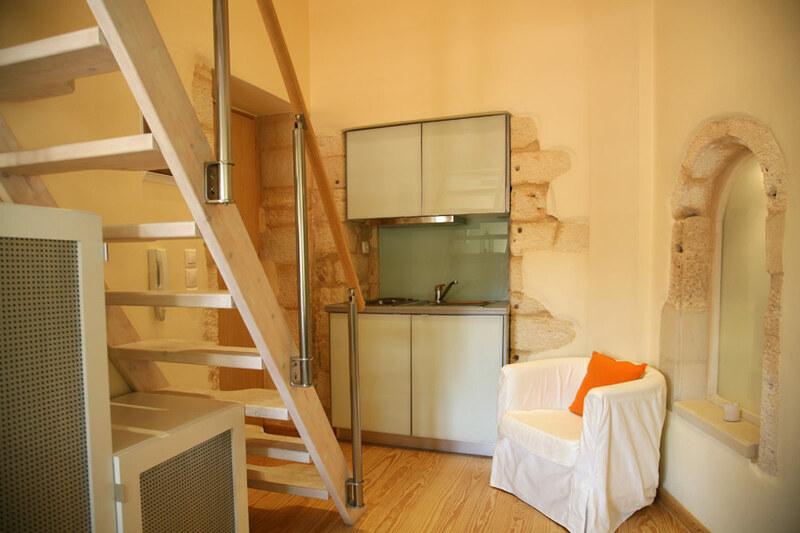 Its cozy atmosphere and chic and offbeat interior design make this haven of peace a hotspot of Chania life. The Boutique Hotel Fortino has an ideal situation between the calm of a residential neighborhood and the bustling Old Port. Only 5 minutes walk from the Central Market, you will have quick access to all major sights of the city. So much to discover, either it is for cultural visits, walks or romantic discoveries... The chic, lively, eclectic neighborhood also offers plenty of cafés and restaurants. Its five charming rooms will awake forgotten memories, hidden desires, and secret weaknesses. They are a romantic oasis a peaceful, stunning, paradisiacal haven. The Boutique Hotel Fortino – is a hotel made for discerning travelers, who seek a special place to be welcomed, a place to feel at home, yet allowing one to forget the everyday routine. A place to keep coming back to and feel the pulse of one of the most beautiful cities in Greece… So, just immerse yourself to the ultimate hideaway! 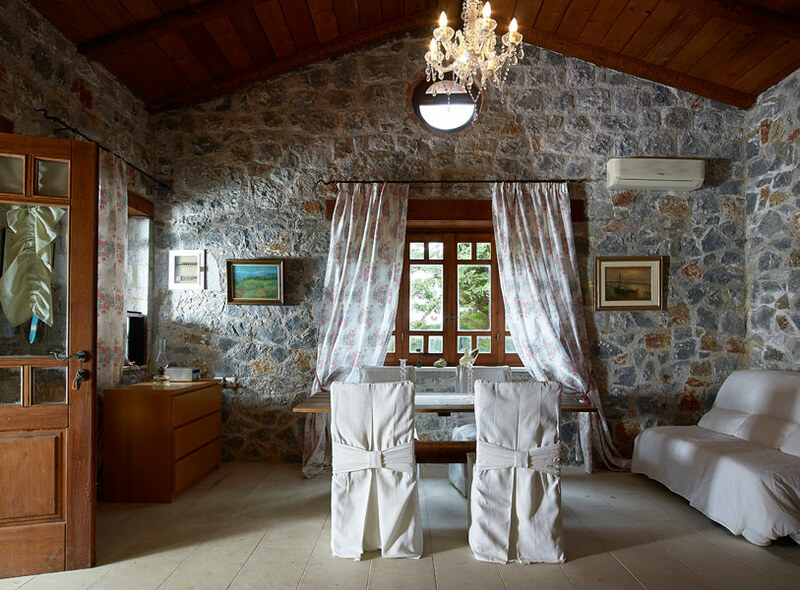 Nothing exists, except you and your dreams… Be amazed by Chania and the Boutique Hotel Fortino & Villas, and Welcome! In the heart of Akrotiri, in Tersanas, 13km from Chania, 5km from the airport of Chania, 700m from the sea and 500m from the shops, you will find 2 luxurious villas of unique beauty, situated in a three acre property filled with olive trees, vines, fig trees and rich vegetation, in absolute privacy. 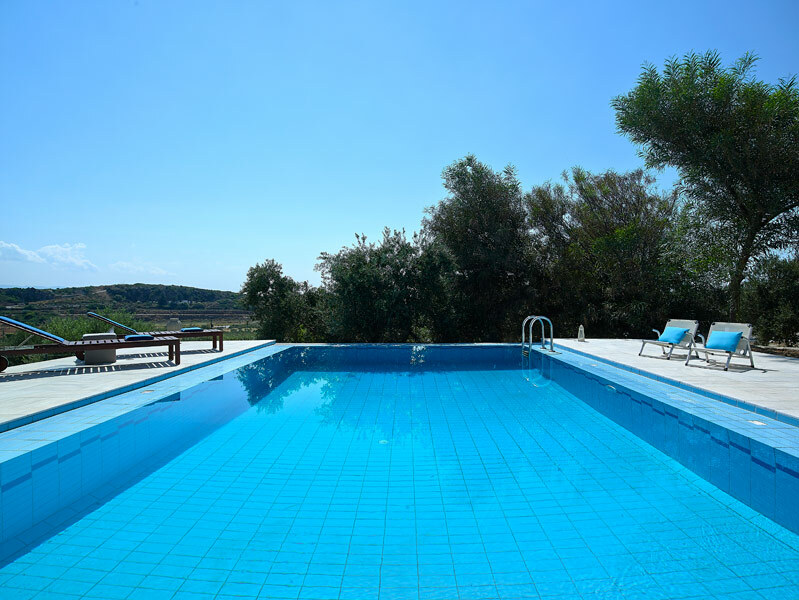 The FORTINO Villas are fully equipped with private pool and garden, a paradise like nowhere else: your holiday in Crete, with absolute comfort in the heart of nature. 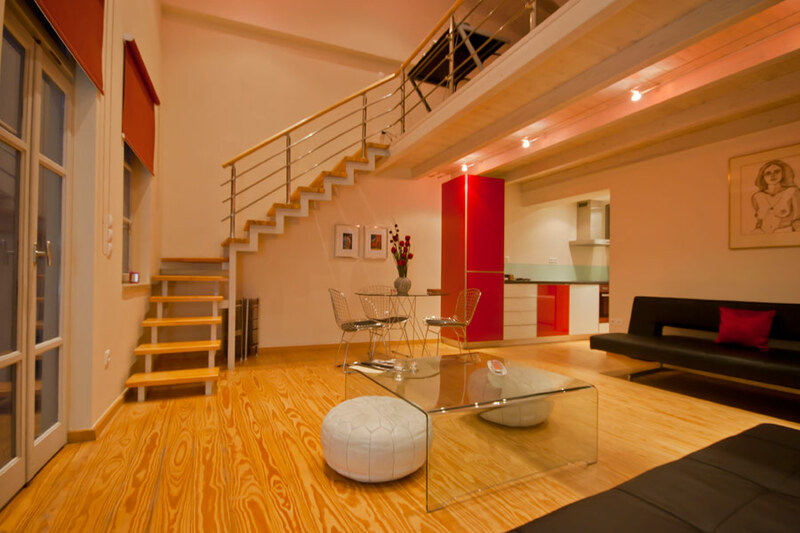 This modern 70m² duplex is located on the top floor of the residence. On its lower level, you will find a large lounge with a dining area, a fully equipped open kitchen, and the bathroom. 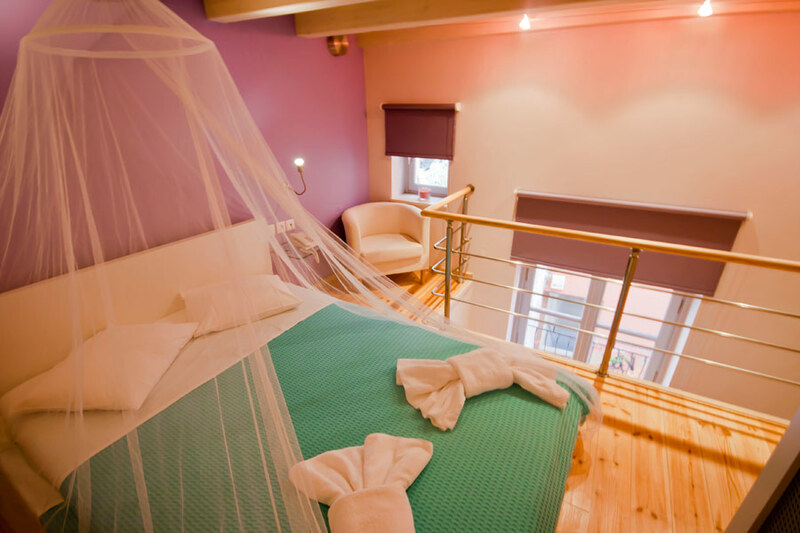 A large 20 m² bedroom is located on the upper floor (king size bed with the highest standards of comfort, over which a canopy will protect every dream or fantasy..). A private terrace offers a breathtaking panoramic view of Chania. Supremely comfortable, and equipped with every comfort, the 30m² two levels rooms ensure moments of pure relaxation. Emphasis is given to the massive wooden floor, to make the separation of the bedroom from the living room. Each one boasts its own individually decorated color interior. Lovely and unique in style, our rooms welcome in a cozy ambiance. 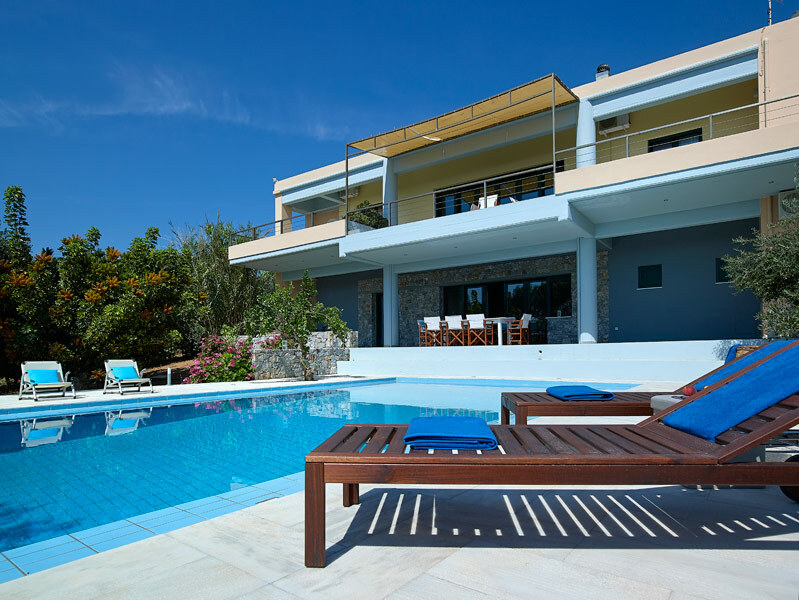 Two storey villa with swimming pool (10m x 5m) and garden and a stunning sea view! Fully equipped open kitchen (vitro-ceramic hotplates, oven, hood, refrigerator/freezer, dishwasher, microwave, kitchen utensils, coffee maker, toaster, etc.). Living room with living and dining area (with satellite TV and fireplace), courtyard (equipped with barbecue, traditional oven and garden furniture) and a large balcony with breathtaking view of the landscape and the sea. The villa is equipped with all modern amenities that guarantee a sense of autonomy, comfort and luxury. Parking, security cameras, 2 bicycles, safe, luxury linen, beach towels, beauty set, sleepers, air conditioning, heating, fans, satellite LCD TV, Wi - Fi (free of charge), telephone, washing machine, ironing board and iron. Villa on two levels with private garden and amazing view of the landscape! Fully equipped open kitchen (electric and gas hotplates, microwave, fridge, kitchen utensils, coffee maker, toaster, etc). Living and dining room (with satellite TV and a sofa bed for 2 persons) with terrace (equipped with barbecue and garden furniture). The villa is equipped with all modern amenities that guarantee a sense of autonomy, comfort and luxury. Parking, security cameras, safe, luxury linen, beach towels, beauty set, sleepers, air conditioning, heating, TV LCD, Wi-Fi (free of charge), washing machine, ironing board and iron. Fully air-conditioned building, Fast service upon arrival and departure, City Guide, city map, tourist information, Luggage room, Laundry service, Reservation service for taxis, restaurants, excursions, small boats, sailing, Car rental service, Baby sitting (on request), Doctor on call. Your desires inspire us to offer a range of customized services to make your holiday special. Customer service: information for the home and town, city guide, city map, tourist information. Cleaning, change of linen, towels and toiletries are every three days. Business use of space for movies, photo shoots, business meetings, etc. Chania, capital of the prefecture of the same name and with 60,000 inhabitants Crete’s second biggest town, is proudly presented as the island’s most atmospheric city. It is a great place for going out and enjoying the good life, with lots of shops to browse and excellent restaurants. Traces of its Venetian and Turkish past, with little fountains and elegant mansions, mosques and minarets are evident everywhere as you walk through the picturesque alleys and the harbour. Along with beautifully restored buildings, there are also still un-reconstructed buildings from Second War bombings that have been turned into charming shops and restaurants. One has to admit that Chania carries its past with dignity, breathing an air of oriental mix where East meets West. Built on the site of Minoan city Kydonia, Chania has been inhabited since Neolithic times. An important centre in Minoan times and a flourishing city-state during the Hellenistic period, it lost its importance in the Byzantine years and in 828 AD it was destroyed by the Arabs. When the Venetians came in the 13th century, they changed its name to La Canea. Fearing attacks from pirates and later from Turks, the Venetians fortified the city’s defense system, only to be subjected to the Turks in 1645. The Turks made it their capital and seat of the Pasha. The city’s face became more oriental, with churches being converted to mosques, the building of minarets and wooden partitions on houses. Chania remained capital of Crete after its liberation from Turkish rule in 1898 until 1971. At the entrance to the harbour, the Gritti bastion, lies the restored Venetian Firkas Fortress, that nowadays houses the Naval museum. Opposite you see the Venetian lighthouse, built in the 16th century. Continue along the best preserved part of the city wall, from the Gritti to the Schiavo bastion. Chania's city wall, as part of fortification works against the Turkish threat, was designed by engineer Michele Sanmichele. Here in the Topanas quarter you can see some of the most picturesque Venetian houses adorning the little alleys. Pass the Renieri gate and admire its elegant arch that is part of the palazzo of the Renieri family, complete with private chapel. Continue your way through the Medieval Jewish quarter; here lies the 15th century Etz Hayyim synagogue, renovated and reopened in the 1990s after it was closed and in a miserable state for a long time. Head for shopping street Halidon on the way passing the Schiavo bastion. If you take the trouble to ascend it, you have a stunning view of the old houses around the harbour, the hilly Kastelli quarter and the Lefka Ori (the White Mountains) to your south. If you’re not, follow Halidon towards the Harbour, on the way practically bumping into the Cathedral, a rather plain church from the 1860s. Clustered around the Cathedral square are a whole range of cafes and restaurants. On the same courtyard, opposite, lies the Archeological Museum, that is housed in the Venetian San Francesco church, with practically next to it the Folklore museum, established in the elegant Roman-Catholic church building. Walking further down to the harbour, you’ll recognize the Mosque of the Janissaries, with its profile dominating the Harbour view like a giant football. It is the oldest Turkish building on the island, dating from 1645, immediately after the Turks settled in Chania. Nowadays it is used as an exhibition hall. Continue along the harbour with the minaret lighthouse in its background on the other side of the quay. It is well worth the 1.5km stroll for a breathtaking view of Chania by night. The quarter of Kastelli, the earliest inhabited area of Chania that lies on a little hill, was heavily bombed during WWII, when next to nothing was left of the former centre of Venetian and Turkish rule. Here are also the fenced sites of Minoan Kydhonia. Passing the Arsenali, the 16th century Venetian shipyards, follow Daskaloyanni Street to reach 1821 square with its churches: Ayios Nikolaos with on its top a minaret. Built by the Venetians, it was converted into a mosque by the Turks, as most churches were, only to be reconsecrated after the Turks left. The Turkish minaret seen from a distance belongs to the former Ahmed-Aga mosque and is worth a look, though it may be closed to visitors. Continue by visiting the covered Market Hall with its many excellent eateries, and its food stalls with a wide variety of fruits, fish and meat. Take a break! From here, take the route back to the harbour by way of the Turkish Splantzia quarter with its maze of narrow streets and alleys, set in an atmospheric decor of 1001 Nights. South-east of the Market Hall in the new town you can reach the Public Garden, where there’s a mini-zoo along with a coffee house surrounded by trees and a children's playground. The county of Chania is divided by the Lefka Ori Mountains into two completely different natural landscapes. The coastal zone, with beaches 415 km long, is richer and more densely populated. The sparsely populated inner territory is one of the most authentic parts of Crete. On most of its mountain tops, temperatures are below zero and from December to May they are covered with snow. On the mountain slopes there are many small traditional villages, forgotten by time, with their stone houses turned towards the sun, certainly interesting “green” destinations of Crete. Day after day, more and more wanderers try to explore them on foot, by jeep, horse or bicycle. 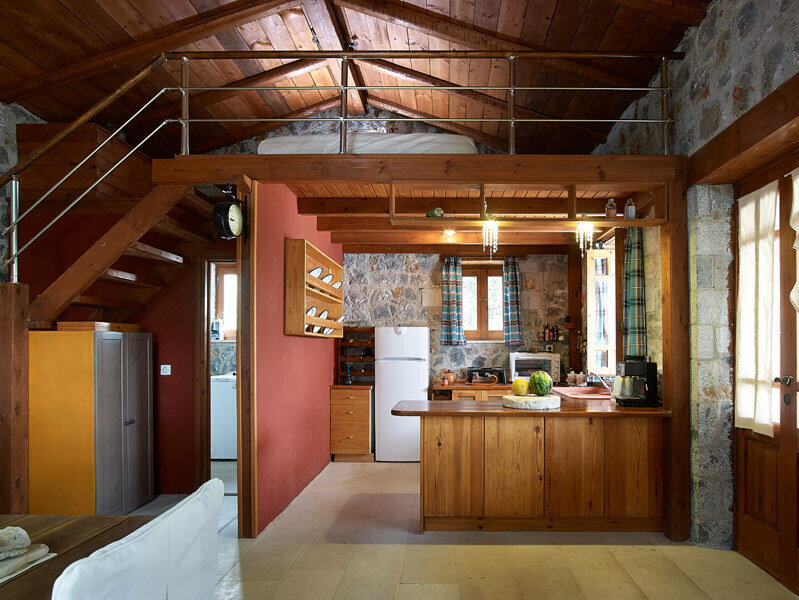 It is possible for the tourist to enjoy the Cretan simple and natural life, to enjoy the Cretan diet with a glass of wine or tsikoudia, to take part in celebrations and to feel the roots of European civilization. Hospitable shelters, establishments for spending your free time and shops with handmade carpets, fine jewellery, embroidery, traditional furniture, ceramics and home-made products (cheese, noodles, marmelades, etc.) of excellent quality guarantee an unforgettable stay. Tersanas is a small coastal village hidden in a small cove on the west side of Akrotiri. It is actually the harbor of Chorafakia village, located just 1km northern. The area is well developed and is a popular destination for holidays. The beach of Tersanas is shaped inside a natural harbor, which looks south. It is a sandy beach with white fine sand and shallow crystal clear water. It is equipped with umbrellas, sunbeds, snack bar and showers. The calm water, combined with the proximity to the touristic facilities, make Tersanas ideal for family holidays. The pond of Maherida is located at the area of Tersanas, next to the stunning beach of Maherida. It is an impressive karstic doline, where springs with brackish water gush. This small lake is an important wetland hosting water snakes, turtles and migratory birds. Access is very easy, as it is right next to the paved road leading from the Tersanas beach to Maherida. The seaside village of Kalathas is in the heart of a large natural bay on the Akrotiri peninsula, which is open to the north winds. The beach in front of the village is beautiful, with fine sand and shallow crystal clear water. Opposite Kalathas, there is a small island which you can easily reach by swimming. Next to the beach there are several palm trees that give an exotic tone to the landscape. Moreover, the beach is very well organized with umbrellas, water sports, restaurants, hotels, mini markets, etc. West of the main bay, beyond the rocky end, there is a secluded sandy bay. Stavros is a seaside village located at the northernmost edge of Cape Akrotiri. One characteristic feature of the area is the very steep camel-shaped mountain rising opposite the harbor of Stavros. The mountain is famous, because there were filmed scenes for the film “Zorba the Greek”, where Anthony Quinn danced the famous Sirtaki Dance in 1964. Then Stavros was a small fishing village. The two beaches of the area have contributed to the development of the area. The main beach is located east of the village, at the foot of the mountain, and next to the picturesque harbor. A circular bay is formed, fully protected by winds blowing in the region. The lagoon-like bay has marvelous white sand and shallow turquoise waters. The contrast of the wild mountain with the peaceful beach in the foreground makes Stavros a unique place for swimming. As expected, the beach is very well organized and provides all possible services. The second beach of Stavros is located north of the village, 200m northwest of the main beach. It has sand and rocks in places and is less organized than the first, but cleaner. The main drawback of this is that it is unprotected and the sea is usually wavy. At the peninsula dividing the two beaches of Stavros, you can see the remains of the ancient quarry, used for extracting limestone for building the Walls of Chania during the Venetian Era (13rd- 17th century). In Stavros you will find many more options rather than accommodation and restaurants, such as mini markets, shops, cafes etc. Moreover, there are bus services from Chania city. Stefanou beach is located near the position of Seitan Limania (satan harbours), 2km east of the village Chordaki, at the east side of Akrotiri Cape. The wider area is named Seitan Limania, after the wild landscape, the steep cliffs and the strong sea streams which are very dangerous. Here are situated three parallel narrow coves, well protected from the waves. In the middle of this wild landscape, it is not expected to see something tranquil. However, in the northern cove a tiny fantastic beach is shaped, with deep azure waters, namely the beach of Stefanou. The beach has fine pebbles and sand, transferred there from the nearby quarry through the canyon Diplohahalo. On the right and the left sides of the cove, huge marble rocks are standing high to protect the beach from the bad weather. It is quite unknown to most people, even the residents of Chania. The monastery of Agia Triada of Tzagarolon is one of the richest and most beautiful monasteries in Crete. It is built near the airport of Chania, in the position Tzobomylos of the Cape Melecha and at the foothills of Stavros Mount. The monastery was built by the Venetian nobles Jeremiah and Lawrence Tzagarolo. Jeremiah was a famous scholar of his era with rich education and was a friend of the Patriarch of Alexandria, Moreover, Jeremiah designed and built the monastery complex of the monastery, being affected by the architect Sebastiano Serlio from Verona, Italy. The monastery today hosts a small museum with various pictures and icons. The most important are the 12th century cloth for covering the altar, the icons of St. John the Theologian (16th century), St. Nicholas (17th century) and the icons of the painter Skordilis: the Enthroned Christ, Living Spring and the Second Coming (1635-1645). Today, after the numerous historical adventures, the monastery continues to play an important role in the religious and economic life of Crete. It is Stavropegic, which means that it is directly managed by the Ecumenical Patriarchate of Constantinople. Visitors will see an incredibly well-preserved and vibrant monastery that produces and exports organic olive oil, wine, honey, vinegar and olive oil soap of unique quality. Gouverneto or Gderneto Monastery is located 19km east of Chania, on the north side of the Cape Akrotiri of Chania, near the monastery of Agia Triada Tzagarolon. It can be accessed through the Agia Triada, where there is a sign leading to the Gouverneto. It is situated on a rocky site at an altitude of 260m, near the entrance of the gorge Avlaki and is built with fortress architecture and four towers with bastions protect its corners. The Gouverneto monastery was built before 1537, as proved by an inscription at the entrance of the fortress, being one of the oldest monasteries in Crete. It is believed that the monastery was founded by hermits and monks of the seaside Katholiko Monastery, who may built the new monastery over a pre-existing ancient temple so as to protect themselves from pirate raids. The church of the monastery is dedicated to Virgin Mary, so it is also called Kyria ton Agelon (Lady of the Angels Monastery). It has a cruciform shape with a dome, while the entrance is decorated with relief representations of monsters. It was started being built during the Venetian Era, but the construction finished 2.5 centuries later, as the Turks invaded Crete and forbid building Christian temples. Around the church of the monastery, which is located in the center of the courtyard, there are the other buildings of the complex. Among them are 50 monk cells in two floors, the dining room, a small museum, etc. Also, next to the church there is two chapels dedicated to Agii Deka (Saints Ten) and Saint John the Hermit. St. John the Hermit lived in a cave in the gorge Avlaki, adjacent to the monastery, and is considered as the founder of the monastery. You can walk in Avlaki gorge by following the stone paved trail that descends to the sea. After 20 minutes of descent you will meet the Arkoudospilio Cave, and after a while the ruined monastery Katholiko and the cavernous church of St. John, where the hermit lived. After more 10 minutes, the gorge ends in a narrow rocky fjord with green waters.